Background: Chronic kidney disease (CKD) is associated with oxidative stress (OS), which occurs even in early stages of CKD and was shown to further contribute to progression of renal dysfunction and increased cardiovascular risk in CKD patients. Majority of studies have evaluated OS in CKD patients using limited biomarkers. Present study aimed at comprehensive evaluation of oxidant and antioxidant status in CKD patients. Methods: 120 patients diagnosed with CKD who were classified into three groups of 40 each [group-1 (CKD stage1 and 2), group-2 (CKD stage3 and 4) and group-3 (CKD stage 5] based on eGFR and 30 healthy controls were recruited. Malondialdehyde (MDA), protein carbonyls (PC), ferric reducing ability of plasma (FRAP), protein thiols, superoxide dismutase (SOD), glutathione peroxidase (GPx) and catalase were measured in all subjects. FRAP was corrected for uric acid (FRAP_UA) and MDA/FRAP_UA ratio was calculated. Score for oxidative stress (SOS) was calculated using the oxidant antioxidant parameters studied. Results: MDA, PC, MDA/FRAP_UA, FRAP and SOS were higher whereas protein thiols, SOD, GPx and catalase were lower in CKD patients than controls. Further, MDA, PC and FRAP and SOS increased progressively and protein thiols, SOD and catalase decreased progressively with increasing renal dysfunction. 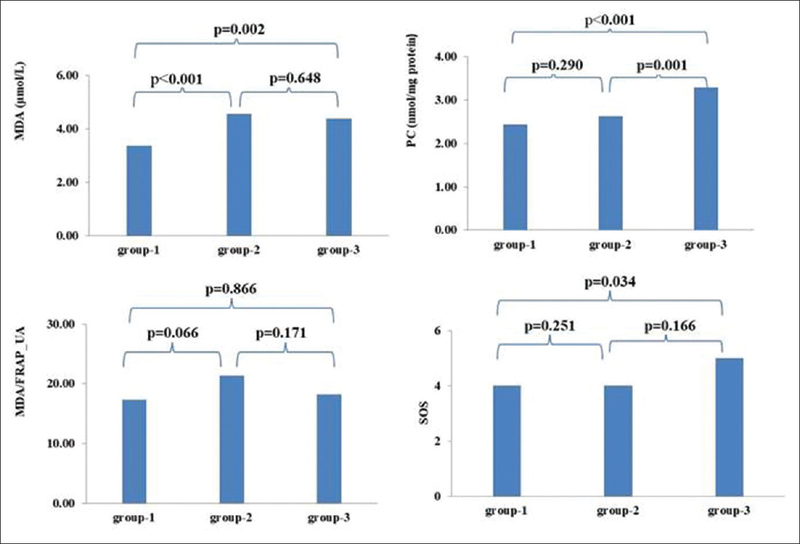 MDA, PC, FRAP and SOS showed positive correlation with creatinine and negative correlation with eGFR, whereas protein thiols, SOD, and catalase showed positive association with eGFR and negative correlation with creatinine. Conclusions: CKD patients are prone for oxidant injury which increases progressively with worsening renal dysfunction and is associated with degree of renal impairment. Score for oxidative stress helps in comprehensive assessment of oxidative stress in CKD patients. Chronic kidney disease (CKD) is a progressive loss in renal function with a growing incidence. The worldwide prevalence of CKD is 11%–13% and the relative risk for mortality in patients with CKD compared to those without CKD is between 0.94% and 5%. CKD is associated with a chronic inflammatory status and a wide range of pathophysiological mechanisms have been studied in CKD. Of these, oxidative stress (OS) plays an important role in CKD. OS which is a state of imbalance between free radicals production and their degradation by anti-oxidant systems, with increased accumulation of the radicals is known to occur in patients with CKD and further contributes to inflammation, endothelial dysfunction, risk of atherosclerosis and progression of CKD. Several pro-oxidant factors, including advanced age, diabetes, renal hypertension, lower levels of anti-oxidant vitamins, uraemia-related factors and dialysis-related factors are known to contribute to the OS in CKD patients. OS, inflammation and endothelial dysfunction form the triad foundation of atherosclerosis in patients with CKD. Thus, the increased OS and its sequelae are majorly responsible for the increased cardiovascular morbidity and mortality in CKD patients and is described as the elephant in uraemia. Progression of CKD can be explained by haemodynamic and non-haemodynamic factors. In addition to causing an increased cardiovascular disease burden in CKD patients, OS also plays an important role in the progression of CKD, either through direct effects on renal tissue or through indirect mechanisms by interacting with other factors. The OS further causes oxidative damage to important biomolecules such as lipids, proteins and nucleic acids resulting in the formation of various compounds such as malondialdehyde (MDA), F2-isoprostanes, protein carbonyls (PCs) and 8-Hydroxy-2'-deoxyguanosine that have relatively longer half-lives and are used as general markers of oxidative injury. Earlier studies have reported altered levels of oxidant and anti-oxidant markers in patients with CKD.,, Studies have also explored the association between markers of OS and renal function and how the OS varies with progressing decline in renal function. However, these studies have measured only a few markers of OS and none of them have comprehensively studied the OS. In this background, the present study was aimed to evaluate the oxidant and anti-oxidant status in healthy controls and patients of CKD Stage 1–5. The association of oxidant-anti-oxidant status with renal function was also analysed. Markers of lipid peroxidation (MDA) and protein oxidation (PCs) were studied along with measurement of anti-oxidants such as ferric reducing the ability of plasma (FRAP) as a marker of total anti-oxidant capacity (TAC), protein thiols (PT) and enzymatic anti-oxidants superoxide dismutase (SOD), glutathione peroxidase (GPX) and catalase. A score for OS (SOS) was calculated based on the analysis of all the oxidant and anti-oxidant parameters studied since a combined evaluation of several markers is likely to provide a more realistic and comprehensive information about OS. The present study is a cross-sectional case-control study conducted in the Departments of Biochemistry and Nephrology, Sri Venkateswara Institute of Medical Sciences, Tirupati between November 2011 and June 2013. The study population included 120 patients diagnosed with CKD and 30 age- and gender-matched healthy controls. Institutional Ethical clearance was obtained before performing the study. All the study participants were categorised into four groups based on estimated glomerular filtration rate (eGFR) calculated using the Cockcroft and Gault formula into Group I (controls), Group II (patients in CKD Stages I and II), Group III (patients in CKD Stages III and IV) and Group IV (patients in CKD stage V). Five mL of whole-blood sample was collected from all the study participants into the heparinised bulb and plain bulb. The plasma and serum collected after centrifugation were aliquoted and stored at -80°C until biochemical analysis. Serum urea and creatinine were measured using commercial reagents on Beckman Coulter Unicel DXC 600 analyser. Serum MDA, PC, FRAP, PT and erythrocyte SOD, GPx and catalase were analysed using spectrophotometric methods on Lambda 25 UV-visual double-beam spectrophotometer (Perkin Elmer, Singapore). Since uric acid is the major contributor to the anti-oxidant capacity measured as FRAP and uric acid levels are expected to be increased in CKD patients, FRAP was corrected for uric acid (FRAP_UA). The ratio of MDA and FRAP_UA indicates the combined effect of free radical generation and the non-enzymatic anti-oxidant defence and hence was calculated and evaluated (MDA/FRAP_UA). To obtain the overall SOS, each oxidant and anti-oxidant marker measured was ranked zero, −1 or +1 using control group mean values as the cut-off value. Results equal to cut off values were assigned zero points (0); results above or below the cut-off values, and pointing towards OS (i.e., increase in oxidant markers and decrease in antioxidants), were assigned one positive point (+1). Values of markers indicating anti-oxidant status (i.e., decrease in oxidants and increase in antioxidants) were assigned one negative point (−1). The sum of these rankings was labelled as 'SOS'. All the data were expressed as either mean ± standard deviation or median (interquartile range) depending on the distribution of data. Independent samples t-test or Mann–Whitney U-test was used as appropriate for comparison of the parameters studied in controls and CKD patients with CKD. Comparison between patients in different stages of CKD was done using the Kruskal–Wallis test followed by pairwise comparisons. The association between markers of oxidant and anti-oxidant status and renal function was studied using the Spearman correlation analysis. A value of P < 0.05 was considered statistically significant. All the statistical analyses were performed using Medcalc Version 12.0 and SPSS Version 16.0 for Windows. The present case-control comparative study was conducted to explain the possible association of OS with the progression of CKD. [Table 1] shows the parameters studied in CKD patients and healthy controls. Among the oxidant and anti-oxidant parameters studied, MDA, PC, MDA/FRAP_UA and FRAP were higher, whereas PT, SOD, GPx and catalase were lower in CKD patients when compared to that of controls. The comprehensive SOS was significantly increased in CKD patients than in healthy controls. [Table 2] and [Figure 1], [Figure 2] show the oxidant and anti-oxidant parameters in the three groups of CKD patients. MDA, PC and FRAP increased progressively with progressive renal dysfunction; PT, SOD and catalase demonstrated progressive decrease with increasing renal dysfunction. SOS also increased progressively as renal function worsened. However, GPx did not show a significant difference across the various stages of CKD groups. 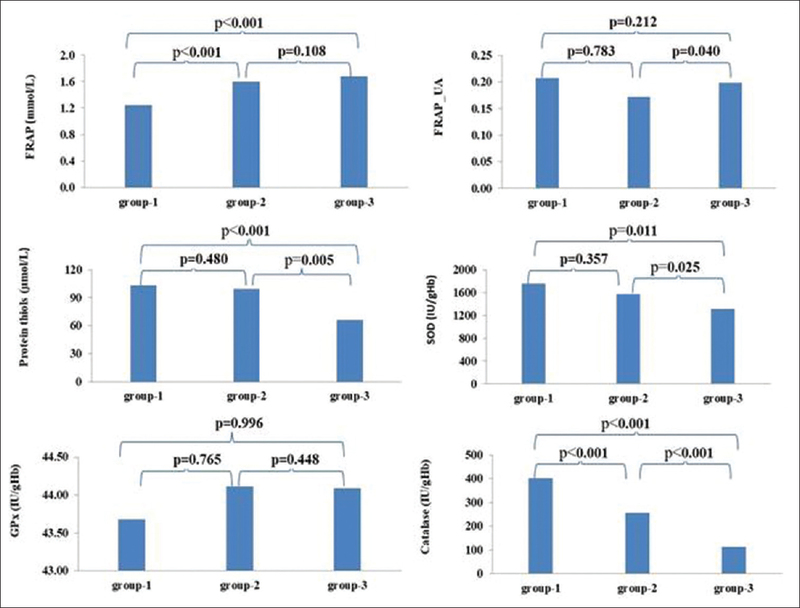 When the association of oxidant and anti-oxidant parameters with renal function parameters (creatinine and eGFR) was assessed using correlation analysis, MDA, PCs, FRAP and SOS showed significant positive correlation with creatinine and negative correlation with eGFR, whereas PT, SOD and catalase showed significant positive association with eGFR and negative correlation with creatinine. 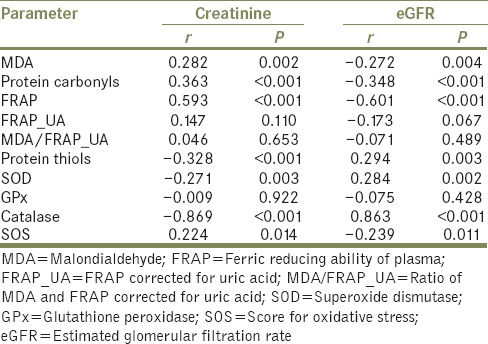 GPx did not show significant correlation with any of the renal function parameters studied [Table 3]. CKD is one of the common chronic inflammatory disorders with an increasing prevalence globally and in India and is also associated with an increased risk of cardiovascular disease. OS is one of the important factors that contribute to increased cardiovascular-related morbidity and mortality in CKD patients. The present study chiefly aimed at evaluating the imbalance of oxidative and non-oxidative mechanisms in CKD patients using various important markers. It was found that MDA levels and PC content were significantly higher in patients with CKD when compared to that of controls. It was also observed that the levels of these markers increased progressively with increased progression of renal disease. Similar results were reported in earlier studies.,, MDA and PCs, which are the products of lipid peroxidation and protein oxidation, respectively, are used as indicators of the intensity of OS. CKD is considered as a pro-oxidant is thus associated with an increased generation of free radicals. These highly reactive free radicals subsequently attack polyunsaturated fatty acids and initiate the process of lipid peroxidation. Similarly, they cause oxidative modification of proteins leading to protein carbonylation. Moreover, increased mitochondrial production of free radicals activates a proinflammatory state that alters protein structure. Thus, the increased MDA and PCs in CKD patients indicates an increased OS and their progressive increase with worsening renal function implies that OS increases with disease progression. Under normal conditions, the production of reactive oxygen species is balanced by cellular anti-oxidant enzymes and hence, evaluation of the activity of anti-oxidant enzymes is used to assess the OS in CKD patients. It is also possible that patients with CKD have a lower concentration of anti-oxidant enzymes making them more susceptible to further progression of the disease. In the present study, erythrocyte SOD, GPX and catalase activities were found to be significantly decreased in patients with CKD when compared to controls. Even among patients in different stages of CKD, the activities of SOD and catalase decreased progressively with increasing renal dysfunction. These findings are in agreement with other studies., SOD, GPx and catalase are the enzymatic anti-oxidant defence mechanisms that are excessively consumed in an attempt to counteract the OS, thereby resulting in decreased levels of these enzymes. However, GPx activity showed no significant change among different stages of CKD. In the present study, CKD patients had significantly lower levels of PT when compared to controls. Similar findings were reported in earlier studies, which have shown a significant decrease in PT in the serum of uraemia patients. The thiol groups (−SH) present on proteins are effective scavengers of free radicals and hence form important and major anti-oxidants in the body. The increased generation of free radicals in CKD patients leads to increased consumption of thiols which could have resulted in the lower thiol levels in CKD patients in the present study. TAC, measured as FRAP represents the total anti-oxidant defence in the body. As CKD progresses, weakening of the anti-oxidant defence is expected to result in lowering of TAC values. However, our results show a significant increase in FRA P values in CKD patients when compared to that of controls. Moreover, FRAP levels increased with progression of CKD with the highest levels observed in Group-3 CKD patients (Stage 5 CKD). Earlier studies have also reported increased TAC CKD patients and attributed this to uric acid levels which were also increased in these patients., Uric acid contributes to 60% of the anti-oxidant activity measured by FRAP assay and in the present study, patients with CKD had increased uric acid levels which could be the reason for the increased FRAP observed in them. Hence, FRAP was corrected for uric acid (FRAP_UA) and was found to be similar between CKD patients and healthy controls as well as among patients in different stages of CKD. On the other hand, MDA/FRAP_UA which indicates the combined effect of oxidants and antioxidants was found to be significantly increased in CKD patients than in controls indicating an increased production of free radicals as one of the causes of increased OS. SOS, which is a multi-biomarker helps to overcome the limitations associated with the evaluation of OS using single biomarkers and hence could provide a reliable and useful new biochemical parameter to evaluate the status of OS in CKD patients. In the present study, the SOS was significantly higher in CKD patients when compared to that of control group. The score also increased progressively with the progression of renal disease with significantly higher values in stage 5 CKD patients when compared to patients in early stages of CKD (Stages 1 and 2). Romeu et al. have used several important biomarkers of oxidant-anti-oxidant status in an attempt to establish a scoring system relating to OS status and found that patients with chronic renal insufficiency had a significantly higher score than healthy controls. Among the various parameters that were included for the calculation of SOS, MDA and MDA/FRAP_UA showed significant positive association whereas thiols and catalase showed significant negative association with SOS. When the association between the oxidant and anti-oxidant parameters with renal function was studied, MDA, PCs, FRAP and SOS showed a significant positive association with creatinine and negative association with eGFR. On the other hand, the antioxidants thiols, SOD and catalase showed a significant positive association with eGFR and negative association with creatinine. A few clinical studies have evaluated the association between markers of renal function and oxidative parameters in CKD patients. Rebholz et al., have reported that plasma fluorescent oxidation products which are biomarkers of the cumulative OS were associated with the degree of renal impairment. On the other hand, Oberg et al., could not observe a significant association between eGFR and biomarkers of OS. CKD, once established usually progresses to end-stage renal disease. The increased OS which is multifactorial in origin in CKD patients is one of the non-haemodynamic factors that contribute to the progression of CKD through direct effects leading to glomerular injury and renal ischaemia or through indirect effects by causing hypertension, inflammation and endothelial dysfunction. Thus, results of the present study indicate that patients with CKD are susceptible to oxidative injury which could further lead to the progression of renal disease and the complications associated with CKD including increased risk of cardiovascular disease. SOS is a comprehensive parameter that incorporates the important oxidant and anti-oxidant components of the body into a single scoring system and provides a better assessment of the oxidant-anti-oxidant balance. Anti-oxidant treatment may help in reducing the OS, thereby improving the survival of CKD patients. Hence, evaluation of these biochemical parameters in CKD patients helps in monitoring the oxidant-anti-oxidant status and to devise effective therapeutic strategies to reduce the OS. Gosmanova EO, Le NA. Cardiovascular complications in CKD patients: Role of oxidative stress. Cardiol Res Pract 2011;2011:156326. Modaresi A, Nafar M, Sahraei Z. Oxidative stress in chronic kidney disease. Iran J Kidney Dis 2015;9:165-79. Meenakshi Sundaram SP, Nagarajan S, Devi AJ. Chronic kidney disease-effect of oxidative stress. Chin J Biol 2014;2014:1-6. Putri AY, Thaha M. Role of oxidative stress on chronic kidney disease progression. Acta Med Indones 2014;46:244-52. Himmelfarb J, Stenvinkel P, Ikizler TA, Hakim RM. The elephant in uremia: Oxidant stress as a unifying concept of cardiovascular disease in uremia. Kidney Int 2002;62:1524-38. Marrocco I, Altieri F, Peluso I. Measurement and clinical significance of biomarkers of oxidative stress in humans. Oxid Med Cell Longev 2017;2017:6501046. Günal SY, Ustündaǧ B, Günal Aİ. The assessment of oxidative stress on patients with chronic renal failure at different stages and on dialysis patients receiving different hypertensive treatment. Indian J Clin Biochem 2013;28:390-5. Aziz MA, Majeed GH, Diab KS, Al-Tamimi RJ. The association of oxidant-antioxidant status in patients with chronic renal failure. Ren Fail 2016;38:20-6. Atamer A, Kocyigit Y, Ecder SA, Selek S, Ilhan N, Ecder T, et al. Effect of oxidative stress on antioxidant enzyme activities, homocysteine and lipoproteins in chronic kidney disease. J Nephrol 2008;21:924-30. Oberg BP, McMenamin E, Lucas FL, McMonagle E, Morrow J, Ikizler TA, et al. Increased prevalence of oxidant stress and inflammation in patients with moderate to severe chronic kidney disease. Kidney Int 2004;65:1009-16. Levine RL, Garland D, Oliver CN, Amici A, Climent I, Lenz AG, et al. Determination of carbonyl content in oxidatively modified proteins. Methods Enzymol 1990;186:464-78. Motchnik AP, Frei B, Ames NB. Measurement of antioxidants in human blood plasma: Protein thiols. In: Packer L, editor. Oxygen radicals in biological systems. Methods in enzymology. California: Academic Press; 1994;234. (D). p. 273-4. Wendel A. Glutathione peroxidase. Methods Enzymol 1981;77:325-33. Benzie IF, Strain JJ. Ferric reducing/antioxidant power assay: Direct measure of total antioxidant activity of biological fluids and modified version for simultaneous measurement of total antioxidant power and ascorbic acid concentration. Methods Enzymol 1999;299:15-27. Sreeram M, Suryakar AN, Kulhalli PM. A study of bio-markers of oxidative stress and inflammation in chronic kidney disease. IOSR J Dent Med Sci 2013;1:6-10. Tbahriti HF, Kaddous A, Bouchenak M, Mekki K. Effect of different stages of chronic kidney disease and renal replacement therapies on oxidant-antioxidant balance in uremic patients. Biochem Res Int 2013;2013:358985. Tucker PS, Dalbo VJ, Han T, Kingsley MI. Clinical and research markers of oxidative stress in chronic kidney disease. Biomarkers 2013;18:103-15. Massy ZA, Stenvinkel P, Drueke TB. The role of oxidative stress in chronic kidney disease. Semin Dial 2009;22:405-8. D'Apolito M, Du X, Pisanelli D, Pettoello-Mantovani M, Campanozzi A, Giacco F, et al. Urea-induced ROS cause endothelial dysfunction in chronic renal failure. Atherosclerosis 2015;239:393-400. Kolagal V, Karanam SA, Dharmavarapu PK, D'Souza R, Upadhya S, Kumar V, et al. Determination of oxidative stress markers and their importance in early diagnosis of uremia-related complications. Indian J Nephrol 2009;19:8-12. Mallikarjunappa S, Prakash M. Urine protein thiols in chronic renal failure patients. Indian J Nephrol 2007;17:7-9. Erdoǧan C, Unlüçerçi Y, Türkmen A, Kuru A, Cetin O, Bekpinar S, et al. The evaluation of oxidative stress in patients with chronic renal failure. Clin Chim Acta 2002;322:157-61. Jackson P, Loughrey CM, Lightbody JH, McNamee PT, Young IS. Effect of hemodialysis on total antioxidant capacity and serum antioxidants in patients with chronic renal failure. Clin Chem 1995;41:1135-8. Romeu M, Nogues R, Marcas L, Sánchez-Martos V, Mulero M, Martinez-Vea A, et al. Evaluation of oxidative stress biomarkers in patients with chronic renal failure: A case control study. BMC Res Notes 2010;3:20. Rebholz CM, Wu T, Hamm LL, Arora R, Khan IE, Liu Y, et al. The association of plasma fluorescent oxidation products and chronic kidney disease: A case-control study. Am J Nephrol 2012;36:297-304.